We idled along and found a push-bike thrown into some long grass by the side of the road, but there was no-one around. I wrote down a description and we decided to go to the police station when we passed it on our travels to report it. We visited a shell museum. The first section was gorgeous with all sorts of interesting things including some of the smallest shells in the world. Boy, were they tiny! I wondered what size the sea-creature residents must have been. If you made a flat layer of them on a teaspoon you would probably have about 50 shells I should imagine. In the various display cabinets there were shells of every size and colour. We left this section to see what else was in store, but there wasn’t. Just another souvenir shop. No wonder there hadn’t been an entry fee! We found an art gallery/café and had a cuppa and then went to the police station to report the bike. By now probably rusted – don’t wait on us to report it if you’re being plundered! highlight of Broome. We looked in all the jewellery shops and one shop assistant tried to treat us as if we were lower-class and in her way, so I flashed the diamond ring – accidentally of course. It sparkled nicely under the jewellers lights! 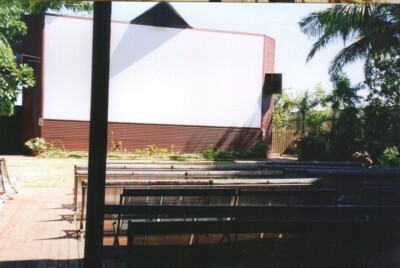 deckchair theatre, named Sun Pictures. We’d heard of this all the way down in Perth and although they can only show films once it’s dark we were allowed to go and have a look. I really liked the place – it was cute and quaint and quirky all at the same time. We decided on a light lunch in the same little café as the day before and were entertained by a lizard, sitting on a wall next to the footpath. A few people passed by, but none noticed him. He just sat there perfectly still. David saw him gobble up a passing insect, but I had looked away at the wrong moment and missed it. He was about 4” long, but his tail was twice that and he was such a pretty little thing. I decided that if I’d been OK for our second flight on the way to Darwin, having reached the point of being on my second dose of medication, then perhaps that was the magic trick so with 4½ hours to flight time I took my first dose of travel sickness tablets. We really wandered around fairly uselessly. I was nervous about flying this time, mostly for fear of feeling so travel sick again and the nerves were starting to take a decent hold. We walked along the beach from China Town almost back to the resort. There were broken beer bottles all over the place at the beginning of the walk. Obviously a hang out. We did see one group of natives amongst the bushes with their native brown bottles. Further along, things cleared up and there were family groups paddling or catching fish. It was quite a novel ‘beach’. It was obviously very tidal [something we’re not used to down in Perth] and there was a thick band of what I think were mangroves before the ocean. So it sort of looked as though we were walking along a river, but we weren’t, it was the shore line. There were little, lapping waves, but mostly the water movement was slowed by the trees/bushes. The locals were very friendly, and most said hello to us before we got a chance to speak to them. You could see all sorts of nationalities in their faces. There were a lot of Malaysian, Aboriginal and Western type influences. I didn’t see anyone Asian looking though. Maybe it’s not their culture to sit near the water? I’m told that the Asian influence is very strong in Broome but we didn’t see this. There was a café on the beach close to the resort [not Cable Beach], so we went to order a cuppa. They were shut. The doors were open, the girl was behind the counter, but they were shut! So she let us buy an ice-cream, and we sat on the grass overlooking the water to waste some more time. I really didn’t feel up to much because the nerves were interfering with my drive to do anything. Sorry David. He would have liked to be out looking/doing poor thing. 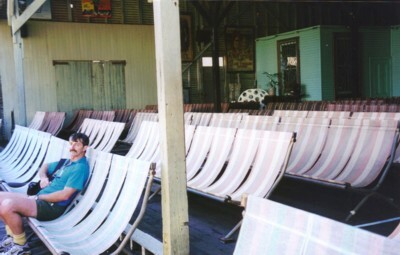 Not that the place was teeming with ideas. We decided to go back to the Satay Hut and have a drink to waste some more time. When we stuck our head in at reception to check that the airport transfer bus had been booked for us, she said that we could have a shower if we wanted, as they had one near the swimming pool for general use. It was a different receptionist to yesterday. Why on earth didn’t yesterday’s tell us that when we booked in! We had certainly looked hot and bothered when we got there. Time dragged. It always does when you have an appointment and nothing much to do before-hand. Eventually, we gathered our cases and went out the front to wait for the bus. I took my second dose of sickness tablets. The bus arrived in due course and took us to the tiny little airport, and we checked in. Finally, they let us on the plane. This time we were on the right-hand side and I thought I’d try again to sit near the window. Unfortunately, we were towards the back of the wings, which obliterated our view somewhat but, by ducking, could see enough. I loved the take off again, and this time we went up smoothly, not all the terrible bucking that we’d done out of Perth. We continued a lovely, steady ascent and banked over the ocean. The ‘being on the 2nd dose before take off’ may have helped too, because I spent the entire journey glued to the window. It was fantastic. Is night-time flying less turbulent than day-time? Just another thought. I even kept looking out during dinner. And I even ate dinner! Dessert was chocolate cake – again! David has now had 3 plane meals in his entire life, and they all had chocolate cake for dessert. Then there really was nothing to see – but I checked regularly. I wish pilots would tell you what you’re passing over and give you a little more info. Eventually, some lights started to appear, and judging by the time, guessed that it must be the outskirts of Perth. It was so exciting! There got to be more and more lights and we were starting to get lower. We did a huge bank to the right, which made me put my hand quickly to the arm of the seat again to stop me falling out. We passed over a huge black area that we still can’t figure out. Perhaps some large lake or something? And then soon, after another, smaller bank, the lights got bigger, the roads became clearly defined by the visible rows of street lights and the car headlights going along them, and then we landed. The end of our holiday. So I guess that is the end of my little? tale. We had a fabulous time and will look forward to the next time. We have a scrap book which is now full of plane tickets, boarding passes, meal receipts and tourist brochures! And 3 films worth of photos. Not many are really suited to send to anyone as they are just sights that we saw. And now you’ve heard all about it anyway. 15,000 words according to my little computer! And now I must proof-read it! Proof reading done and quite a few extra words added so I’d better sign off. Thank you for sharing our holiday with us. I hope you enjoyed it too. OH and David looks so young in that photo by the pool ~ WooT WooT ! self flushing toilets but have never seen the doors open automatically yet LOL! But then I haven’t been everywhere in Canada have I Haha! Thanks it was a pleasure again and definitely will continue, I am happy to read that possibly flying now will be all good for future trips YAY! LOL David *was* young back then. 15 years ago he was 43, a mere baby. He’ll be 60 this November. We’ve seen other automated loos since then, but 15 years ago it was a real novelty to us. Automatically opening doors is a little scary and I always take David in them with me in case the ‘help shut quick’ button needs pushing! Thoroghly enjoyed the story, but I ask you when did you do your trip to Hawaii? I did expect to see it somewhere here. Thanks for reading and commenting PP! You are right, we went to Hawaii in September 2001 including having a flight grounded because of the ‘September 11’ events. I did not write a story at the time and regret it. One day I will see what I can reconstruct from the photos and see if a story can be had from it.